On our web­site you will see what we affec­tion­ate­ly call the “Squig­gle”. The ori­gin of this line goes back at least a year, the work of two design­ers. Back then, I was sim­ply search­ing for some sym­bol of dis­rup­tive ambi­gu­i­ty, the state of a leader’s mind when — in terms of the future of his or her organ­i­sa­tion — there are far more ques­tions than answers. In such a con­fused, chaot­ic state of mind, nextsens­ing is not only help­ful — it’s crit­i­cal! Since it was first used, I haven’t real­ly giv­en much more thought about our squig­gle. Till a few days ago. As I was prepar­ing for this blog, I dis­cov­ered the “design squig­gle” of Damien New­man (which he had craft­ed some time ago to help explain the design process. I was delight­ed to see that he, too, saw the con­nec­tion between design think­ing and ambi­gious prob­lem solv­ing — just as I have on this project. Then, news broke that Pres­i­dent Barack Oba­ma had decid­ed to nom­i­nate Jacob Lew as the next Sec­re­tary of the US Trea­sury. As is typ­i­cal in nation­al pol­i­tics any­where, some say the appoint­ment is bril­liant. Some say it’ll do. Some say it is a dis­as­ter. Hmmm. Okay, I can see everyone’s con­cern about this “sig­na­ture” on US cur­ren­cy. And this should be a spe­cial con­cern as the US steers into some head-bang­ing nego­ti­a­tions about rais­ing its nation­al debt, which (if vio­lat­ed) would vio­late the full faith and cred­it con­di­tions required for any cur­ren­cy to be accept­ed world­wide. One must always hope that the full faith and cred­it of the Unit­ed States nev­er fall into a state of dis­rup­tive ambi­gu­i­ty. White House chief of staff Jack Lew’s sig­na­ture has been ridiculed as noth­ing more than a series of child­ish loops — a non­triv­ial point, giv­en that Pres­i­dent Barack Oba­ma is expect­ed to nom­i­nate Lew as the new Trea­sury sec­re­tary, mean­ing his sig­na­ture will adorn new U.S. cur­ren­cy. Now, Yahoo News exclu­sive­ly brings you the Jack Lew Sig­na­ture Gen­er­a­tor. Just type in your name, hit the but­ton, and see what your name would look like in his, er, sig­na­ture style. Can you guess what’s com­ing next? I mean, I just had to do it. 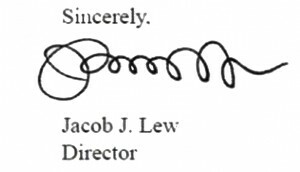 I had to see what my own name would look like if I signed doc­u­ments in the man­ner and style of Jack Lew. I wouldn’t have thought of it, but Yahoo! made me do this. Made me! Ready? Whew! Am I relieved. I was afraid they might look sim­i­lar. Got­ta sign off, for now.